Indian skipper Mahendra Singh Dhoni on Tuesday said his team would keep sentiments aside while preparing for the three-match ODI series against Pakistan to be held in December. “As professional cricketers, we are taught not to really get into the emotional side. So, the series has been placed, and we have to get ready for the series. As professional cricketers, we have to be ready for that series also,” he told media in Chennai. Interacting with media at the end of a two-day camp here, Dhoni said as professional cricketers we are supposed to win every game, especially against Pakistan. “We will be ready for it, because we are not the persons who decide. But now that the series is out, we are supposed to be prepared for it, because our country’s name is at stake. So, as a professional cricketer, that’s what we are supposed to do, go on the field and try to win every game, especially if its against Pakistan,” he said. On Monday, the Board of Control for Cricket in India (BCCI) decided to invite Pakistan for a three-match ODI series in December. Cricketing ties between India and Pakistan were snapped after the 26/11 Mumbai terror attacks. India and Pakistan last played a bilateral series in November 2007, in which the former beat the latter 3-2. Since then, there has been no bilateral cricket between the two arch-rivals, even though they did face each other in the 2011 World Cup. Though a bahu of Pakistan, tennis ace Sania Mirza will support the Indian team when the two countries resume their bilateral cricket ties in December this year. 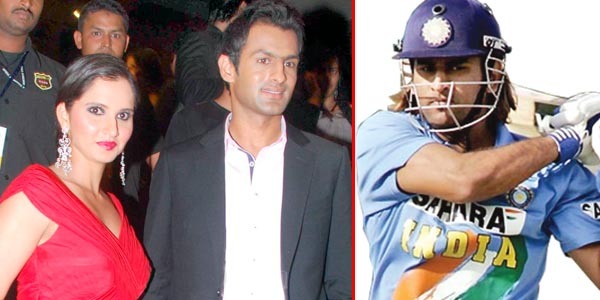 Sania’s father, Irfan Mirza said, “Of course our family will support the Indian team. Sania too will support Team India. She was born in India and we will support the Dhonis, Sehwags and Tendulkars.” Irfan, however, doesn’t forget to add a “but”. “Sania will also support her husband if he is chosen to play for Pakistan,” he says. While Shoaib Malik’s family stays in Pakistan, the couple has not settled there. “Sania had been to Pakistan once after that,” says Irfan, adding, “There was no tennis tournament there but once I accompanied her when Shoaib was playing in Pakistan.” Irfan, however, was not willing to comment on the BCCI’s decision to resume ties between the two countries. “If the decision is taken by the Board to restore connections after five years, I don’t want to say anything. It is between the Indian government and the Board officials,” he says.